Composed in 1741, after a commission of virtuoso J.G. Goldberg, Bach’s Goldberg Variations is a demonstration of unmatched craft in music history and genuine, poetic imagination. This sublime, compassionate and relentlessly intricate work, consisting of an aria and 30 variations, still engages scholars hundreds of years after its publication and is equally valuable for attracting new listeners to the magnificent music of J.S. Bach. In 1819, Viennese publisher Anton Diabelli sent a letter to a number of leading composers of the time (including Schubert, Czerny and Liszt), asking each of them to write a variation on a waltz he composed. His idea was to publish the collection, and raise money to support the orphans of soldiers killed in the Napoleonic wars. Beethoven initially declined, then he decided to submit one variation, and eventually, he was so fascinated by the idea that over a period of four years and while working on his 9th Symphony, he composed a set of 33 variations based on Diabelli’s theme. The result is a work of exhilarating humour, described as “the greatest of all piano works”, where the utmost elaborated compositional techniques are combined with concrete operations of historical reinterpretation, quotations and musical parody. Born in Kharkov, Ukraine in 1976, Konstantin Lifschitz was enrolled in the Gnessin Special School of Music in Moscow at the age of five, as a student of Tatiana Zelikman. After graduating he continued his studies in Russia, England and Italy where his teachers included, amongst others, Alfred Brendel, Leon Fleisher, Theodor Gutmann, Charles Rosen, Karl-Ulrich Schnabel, Vladimir Tropp. In the early 1990s, Konstantin Lifschitz received a grant from the Russian Cultural Foundation. Around that time, he started to perform in European capitals. He toured Japan with The Moscow Virtuosi under Vladimir Spivakov, while in Europe he toured with the St Petersburg Symphony Orchestra under Yuri Temirkanov, and also performed with Mischa Maisky and Gidon Kremer in many European cites. In 1995 he received the ECHO Klassik Award of “Most Promising Artist of the Year” for his first recording, and the following year he was nominated for a Grammy award for Bach’s Goldberg Variations. As a soloist Konstantin Lifschitz has collaborated with leading conductors such as Mstislav Rostropovich, Vladimir Spivakov, Yury Temirkanov, Sir Neville Marriner, Bernard Haitink, Sir Roger Norrington, Fabio Luisi, Marek Janowski, Eliahu Inbal, Mikhail Jurowsky, Andrey Boreyko, and Christopher Hogwood. As a passionate chamber musician, Konstantin Lifschitz has collaborated with such artists as Gidon Kremer, Misha Maisky, Maxim Vengerov, Mstislav Rostropovich, Vadim Repin, Dmitry Sitkovetsky, Alexander Rudin, Natalia Gutman. The 2016/17 season includes the premiere performance of Benjamin Yusupov’s Concerto and collaboration with the Taiwan National Symphony Orchestra, and numerous recitals in the US, UK, Mexico, Hong Kong, Taiwan, Japan, Switzerland, Germany, Turkey, Russia, Czech Republic in venues such as the Berlin Konzerthaus, New York’s Alice Tully Hall and London’s Wigmore Hall. Also, appearances at festivals such as Kutna Hora International Music Festival, Interlaken Classics, Aix-en-Provence, Music@Menlo of California, Montréal Bach Festival, Beethoven Fest Bonn and Trans Siberian Art Festival, in Beethoven’s Triple Concerto with Vadim Repin and Misha Maisky and the Novosibirsk Philharmonic Orchestra. Konstantin Lifschitz also appears frequently as a conductor with such orchestras as Moscow Virtuosi, Century Orchestra Osaka, Solisti di Napoli Naples, Philharmonic Chamber Orchestra Wernigerode, St. Christopher Chamber Orchestra Vilnius, Musica Viva Moscow, Lux Aeterna and Gabreli Choir Budapest, Dalarna Sinfonietta Falun and Chamber Orchestra Arpeggione Hohenems. Leading from the piano, he released all of Bach’s seven keyboard concertos with the Stuttgart Chamber Orchestra. 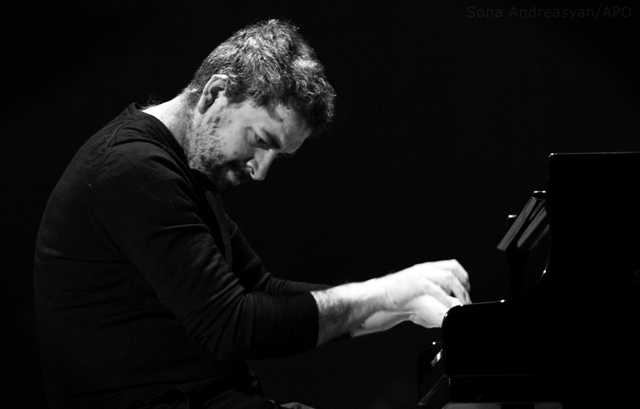 As a prolific recording artist, Konstantin Lifschitz has been releasing numerous CDs and DVDs, many of which have received exceptional reviews. He has made several recordings with the Orfeo label including Bach’s Musical Offering, the St. Anne Prelude and Fugue and Three Frescobaldi Toccatas (2007), Gottfried von Einem’s Piano Concerto with the Vienna Radio Symphony Orchestra (2009), Brahms’ Second Concerto and Mozart’s Concerto K.456 under Dietrich Fischer-Dieskau (2010), Bach’s The Art of Fugue (2010), the complete Bach Concertos for keyboard and orchestra with the Stuttgart Kammerorchester (2011), Goldberg Variations (2015) and most recently, the album Saisons Russes with works of Ravel, Debussy, Stravinsky and Jakoulov (2016). In 2008, a live recording of Lifschitz's performance of Bach’s Well-Tempered Clavier (Books I and II) at the Miami International Piano Festival was released on DVD by VAI. In 2014, Beethoven’s complete violin Sonatas with Daishin Kashimoto was released by Warner Classics.